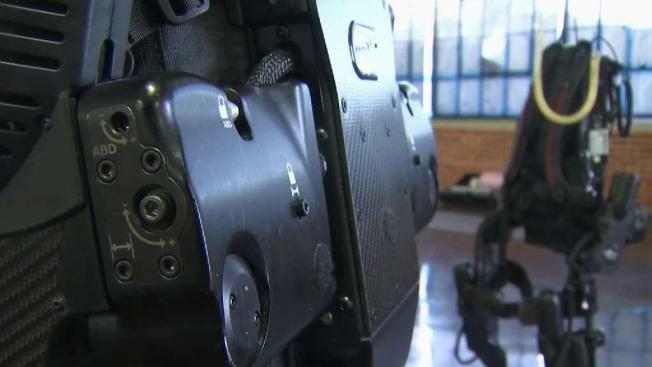 A Bay Area company that developed what looks to be a real-life Iron Man suit put its product on display Wednesday in Richmond, outfitting a paralyzed man in its exoskeleton and allowing him to temporarily walk again. Exso Bionics makes the human exoskeletons for patients with spinal cord injuries or other problems that prevent them from walking. "A human exoskeleton is a robot that you put on and wear," CEO Jack Peurach said. The "test pilot" for the suit has been Mark Pollock, who has been testing the exoskeleton for about five years. Pollock, who's from Ireland, went blind at the tender age of 22 and 10 years later broke his back in a fall. "I was in university, just about to start a job in investment banking," Pollock said. "I was rowing crew for my university and country, and at age 22, I went blind in the space of two weeks." Ten years later: "I fell out of a third story window and broke my back and had to start again." At the former Ford assembly plant in Richmond, Pollock demonstrated his new start with the exoskeleton. He has taken more than a million steps in the five years he’s been using the suit. "On the hope side of the equation, standing up, moving, gives a great sense of progress," Pollock said. Peurach says people tell him it looks like a super hero suit. But the user isn’t totally independent. A physical therapist or medical professional must help the patient put the gear on and then operates it with a remote control. The patient starts walking again, re-learning the movements and training to gain back strength in other parts of the body. The company hopes one day, the suit won’t just be for therapy, but it will be the only thing a patient needs to walk. "Put this on, maybe just like a pair of pants, and walk to wherever they need to," Peurach says is his goal. Right now, the exsoskeleton is only available at certain hospitals and not for sale to private citizens. Peurach says Exso Bionics has plans for 300 robots at medical facilities around the world.